This 100% cotton bristol is an industry standard. * It has been the choice among sequential art professionals and award winning illustrations for years. 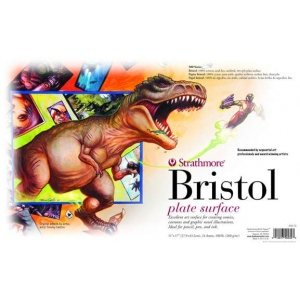 * Plate surface has an ultra-smooth finish that is unsurpassed for detail work using traditional pen and ink tools specialty pens specialty markers and airbrush. * Semi-smooth is slightly textured. * It is suited for pen and ink tools pencil specialty pens and markers. 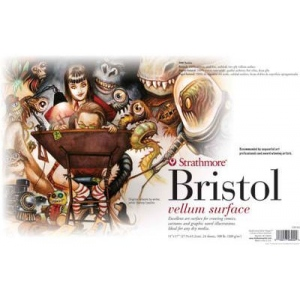 * Vellum surface has a toothy finish that is excellent for graphite pencil colored pencil sketching sticks specialty pens and markers. * It is also very good for charcoal pen and ink airbrush and light washes. * Pads and packs have 24-sheets.